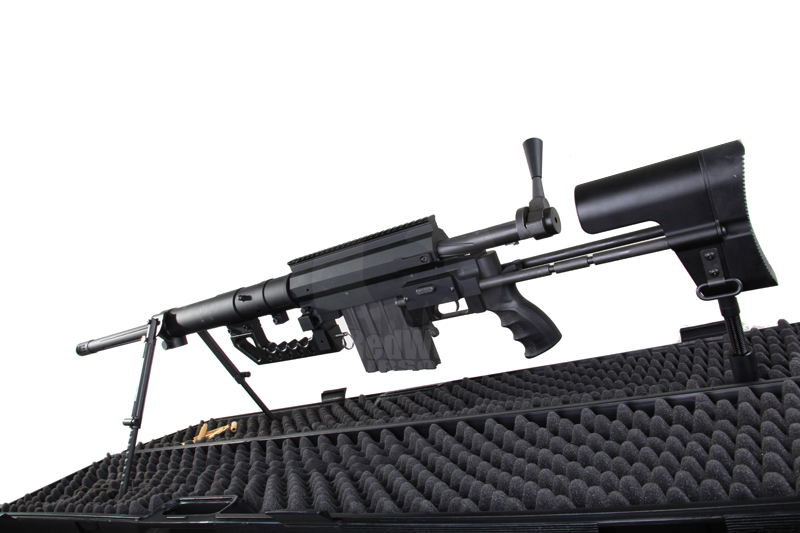 The real steel Cheytac M200 Intervention rifle is part of Cheytac's Long Range Rifle System which combines the weapon with low-drag bullets, advanced sighting and a ballistic calculator to give it unparalleled long range performance. 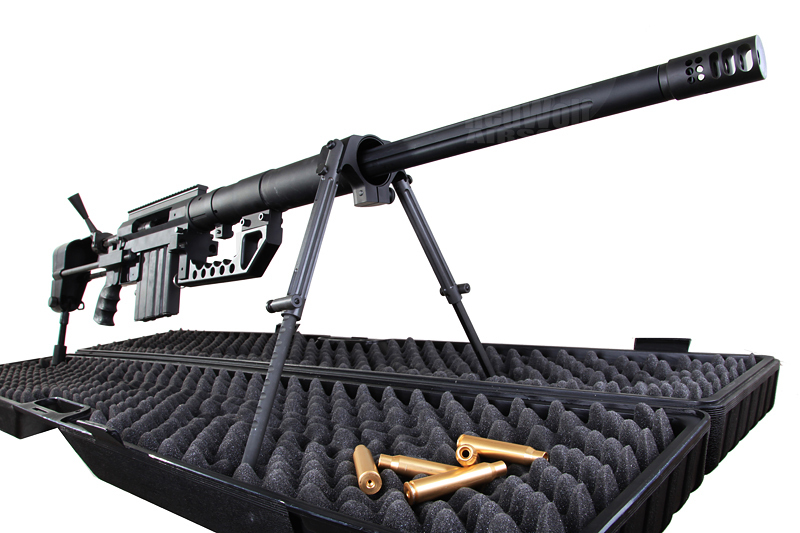 Using the .408 Cheytac ammunition, the rifle can engage targets out to a mile and a half. This incredible weapon has made quite a splash since it came out having been seen the 2007 Movie Shooter and on Discovery Channels Future Weapons. 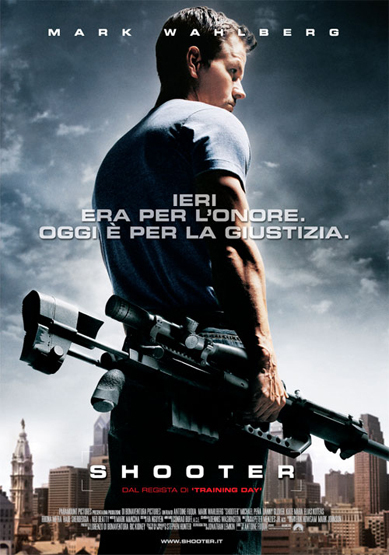 It has also made an appearance in many computer games including Call of Duty: Modern Warfare 2. 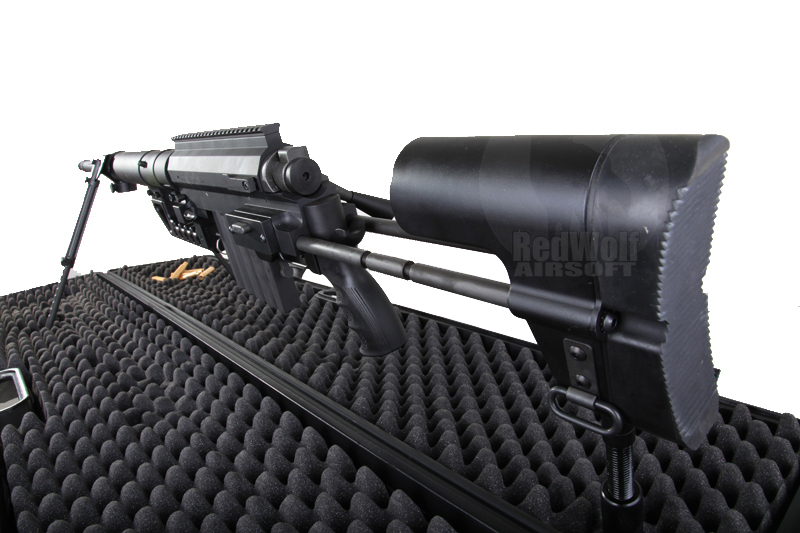 Socom Gears Cheytac is fully licensed and built using blue-prints from Cheytac for incredible authenticity. It recreates the real weapon to an incredible degree of accuracy. It is exactly the same weight as the real steel at 31 lbs or 9 kg. (Yes, shipping is not cheap because of the incredible size and weight of this beast) It is only a few millimeters longer than the real steel and the stock extends 20mm longer but is otherwise almost identical. Together with the included rugged ABS padded gun case, this whole package tops the scales at over 13Kg! Before you get this gun, make sure you are strong enough to lug this beast around! On Green / Top gas, it is spitting out 8mm 0.35g BBs at about 330 fps which means about 1.8 joules of energy. Thats about the same as a 6mm 0.2g pellet doing 440 fps. The hop-up is adjustable with a tool on the top-side. With high grade Marushin ammunition, correctly tuned hop-up and the right conditions this weapon can knock shots out to about 50m or 160 feet in stock form. It can potentially outshoot and outpower ANY airsoft gun in the market today (Please check your local laws to ensure any upgrades you perform remain within legal power restrictions). This means that the SOCOM GEAR M200 is proportionately correct in it's range and pwoer with respect to lesser small arms in the Airsoft realm. Large, heavy pellets will get there slower than a smaller, lighter 6mm with the same energy but the 8mm will hold energy better and make its presence all the more felt at longer range. You WILL feel considerable impact from an 8mm BB. The magazine can hold 7 rounds but then weapon only comes with 5 cartridges. That said, even with 5 such shells it can get a bit tense when loading the last one and stretching to 7 might be too tightso you'll really need to push down hard for the last 2 rounds - just like the real Cheytac M200! 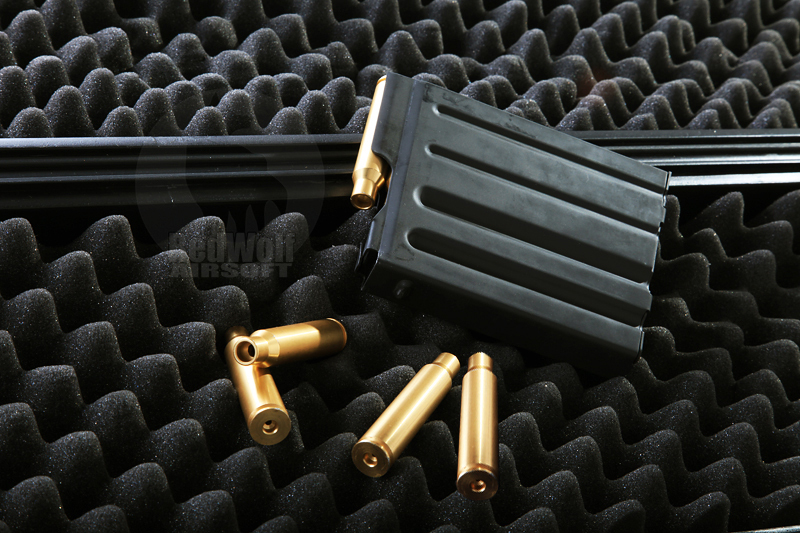 The weapon does not come with any optics but its long upper accessory rail makes it easy enough to fit one. The lack of an optics is probably just as well, they do not insult you by forcing one upon you but instead withhold it so you do not have to pay for one that you will probably swap out for something of your own more personal choice anyway. 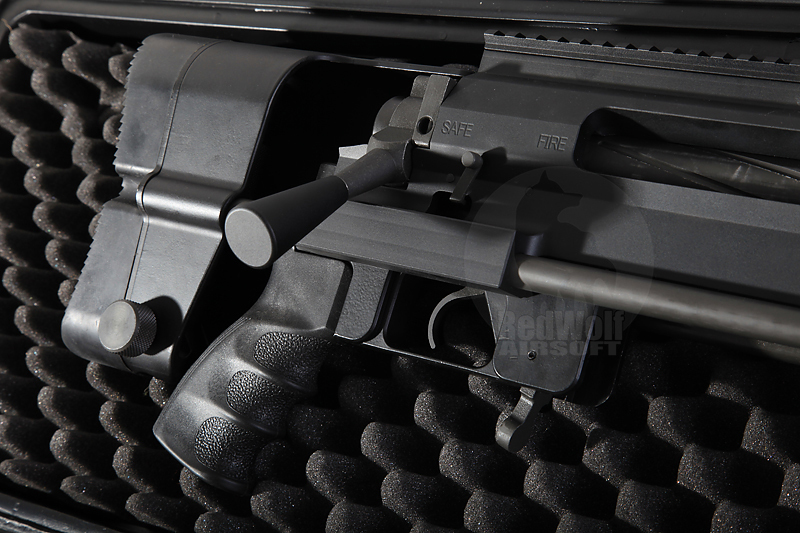 The weapon uses a WA gas M4 type pistol grip which means swapping it out for an aftermarket one is incredibly easy should you wish to replace the included ergonomic black grip with a different option. 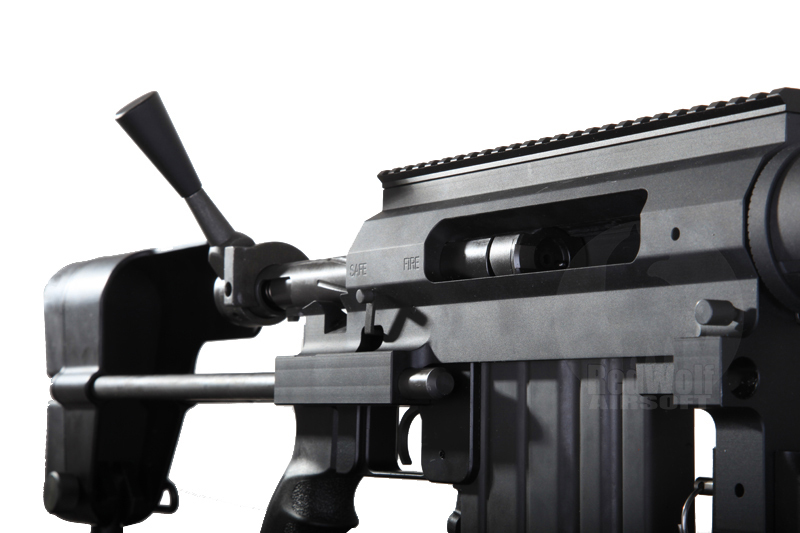 The bipod can be removed if you wish but with its massive weight you might as well leave it on. The two legs are re-positionable separately, each with its own lock to hold it up or down and the legs can also be adjusted for length. 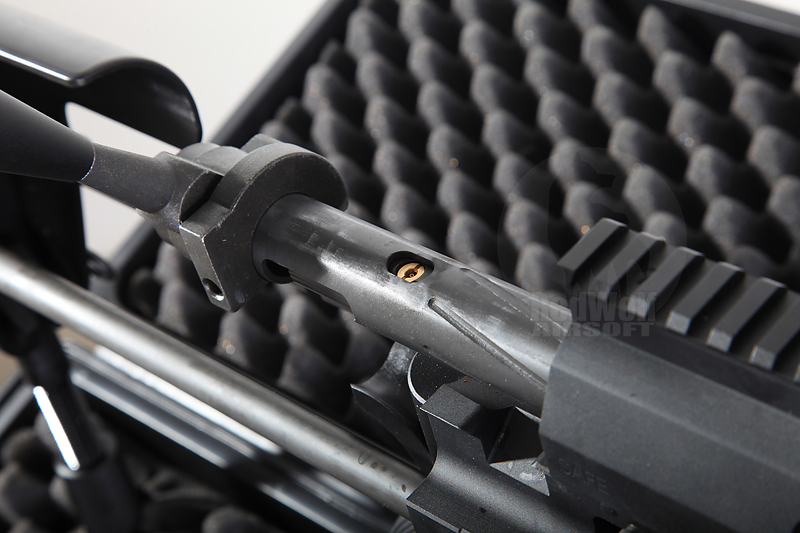 The stock is adjustable for length but only the longest two positions are usable as the bolt is pulled back into it and the forward positions are too short for a proper bolt pull length. This does mean that with the stock folded down for transport the bolt is prevented from achieving a full cycle making an accidental racking impossible. There is no doubt that it is capable of incredible sniper performance but with its large size and weight it is not for the feint of heart. If you are sniping in defense of a secure location, this rifle is very formidable and will knock out opponents from considerable range (after upgrade). Should you have to re-locate, that could prove tricky and you better be in good physical shape. In any case, there is simply no doubt that this is an incredibly gorgeous weapon, an obvious choice to form the centrepiece of a display or taken to a game or event for photo opportunities. Fully licensed and designed from blueprints supplied by CHEYTAC (the real gun company), this gun is as close as you can get to he real thing. If you roll up to a game with one of these, you are sure to be rocking the biggest, baddest looking weapon in the game. It even comes with its own rugged carry case which helps you cart it around as well as better look the part. We recommend the specific use of Marushin 8mm BBs as they are high grade and precise in size. Other brands may be too small or inconsistent in size and cause bad gas flow seals resulting in reduced or compromised performance.